Post by History in Color. History in Color did get their details wrong on this. This is not the 1912 East River escape (on July 7). This is actually from his July 15, 1914 escape at Battery Park. 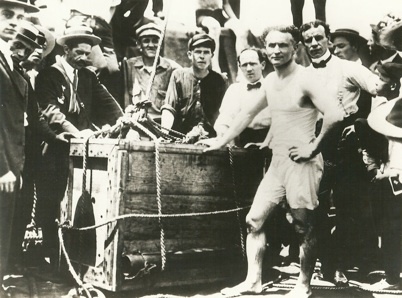 15,000 people crowded the shore to watch, and Houdini had a close call, which I will detail in a future post. Thanks to Axis Theatre Company for this find, and to MANTOO for catching the dating error. Weird isn't it? I'm not used to seeing Houdini in color. For me it's as if he lived in a world of black and white. Isn't that Kukol in front and Collins behind him? His hands are dirty but won't stay that way for long. Yep, that is Kukol and Collins. I wonder how they decided on the color of the swimsuit? This is the color I imagined in my mind, but I was surprised a while back to read a newspaper account of a bridge jump and it described Houdini as wearing a red bathing suit. This is really interesting. The photo is fantastic. However, the NY Times article, which is fantastic by the way, states that his bathing suit color is different from the one they chose for this colorized photo : "Once aboard the lugger, Houdini began preparing for his ordeal, first by removing his clothing, and appearing in a bathing suit of spotless white, in which he posed for his photograph countless times." Hmmm... I didn't notice that. Or, it is the 1912 escape and the colorist just got the color of the suit wrong. It's possible they made it this grayish color not so much for accuracy, but maybe so that the handcuffs would pop out and be more visible. Okay, dang it! I just pulled out my original clippings from the July 8, 1912 escape and, boom, in the NY Herald there's a pic of him in the all white bathing suit (including pants). So this is not 1912. Jackpot. I think an email to History in Color is in order. I'd like to try and confirm the date of the photo. I think it's 1914, but I'm trying to find a source. Okay, here we go. Kellock has 2 photos from this escape dated 1914. But the clincher is in Henning, page 161, there is a shot of HH stepping into the crate, and on the photo itself is ©HOUDINI 1914. Also in that shot you can see this isn't a tugboat. It's dockside. Photo from the 1912 escape -- all white bathing suit. Article revised with thanks to the Mighty Mantoo! More proof that wildabouthoudini.com is the most accurate, up to date and trustworthy authority on all things HH. Finally, my name in print! The NY Tribune Thursday July 16, 1914 has a different photo, but he is wearing the same suit. According to the article he was thrown in the water off the tug J.A. McAllister and escaped in about 1 minute. Good work, Joe. So this is a tug. Check out Houdini on Magic page 36. This appears to be his "Daring Dive" escape at the Battery (or off the Battery) on July 15. Didn't Houdini use the tugboat whenever he was denied permission to perform this at a local dock? Yes. He also did this for bridge jumps. I believe he had to call out the tug in 1912 because police arrived and refused to let him do it from the dock as he wanted. Not sure if this is why is used a tug in 1914. He might have needed it to get out to deeper water. Or maybe it was the only way he could get a permit. One big difference between 1912 and 1914 is that in 1912 they slid the crate down a plank into the water. In 1914 they used a block and tackle. BTW, 1914 was filmed by newsreels and Houdini's own film crew. Not a bit of that film has survived, as far as I know. Wow ! love the colourisation. Working up a post on the Battery Park escape now. Amazed that this isn't covered in many of the major bios.